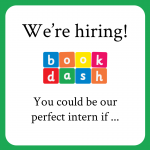 Book Dash is looking for an Intern and it could be you! For all the information, check out the video below or scroll down to view each slide separately. This is a full-time, paid Cape Town-based internship, suited to a skilled graduate. The intern will assist the Directors with the diverse range of tasks required to run Book Dash. You would gain unique insight into a dynamic organisation working at the intersection of the publishing and social impact. Fluency in both an indigenous South African language as well as English will be prioritised. A valid driver’s license is required and own transport preferred. Help with executing monitoring and evaluation. To apply, please send a letter of motivation to team@bookdash.org with your Full Name and “Internship” in the subject line. CVs are not requested. Make sure to tell us all about yourself, how your skills and experience make you perfect for this position, and why you want to join the Book Dash team. Letters of motivation are due by 5pm on Monday, 25th February 2019 to team@bookdash.org.